Alber, E., van der Geest, S. and Whyte, S. Reynolds (2008) Generations in Africa: connections and conflicts. Münster: Lit Verlag. Bähre, E. (2007) ‘Reluctant solidarity: death, urban poverty and neighbourly assistance in South Africa’, Ethnography 8 (1): 33–59. Bank, L. J. (2011) Home Spaces, Street Styles: contesting power and identity in a South African city. London and New York NY: Pluto Press. Bello-Schünemann, J. and Aucoin, C. (2016) ‘Africa’s future is urban’, ISS Today, 2 December <https://issafrica.org/iss-today/africas-future-is-urban>. Bjarnesen, J. (2015) ‘The ambivalence of neighbourhood in urban Burkina Faso’, Anthropology Southern Africa 38 (3–4): 331–43. Carsten, J. (2004) After Kinship. Cambridge and New York NY: Cambridge University Press. Carsten, J. (2013) ‘What kinship does – and how’, HAU: Journal of Ethnographic Theory 3 (2): 245–51. Chalfin, B. (2014) ‘Public things, excremental politics, and the infrastructure of bare life in Ghana's city of Tema’, American Ethnologist 41 (1): 92–109. Chari, S. and Gillespie, K. (2014) ‘Introduction: urban mutualities’, Anthropology Southern Africa 37 (3–4): 145–8. Christiansen, C., Utas, M. and Vigh, H. E. (2006) Navigating Youth, Generating Adulthood: social becoming in an African context. Uppsala: Nordic Africa Institute Press. Cole, J. and Durham, D. (2007) Generations and Globalization: youth, age, and family in the new world economy. Bloomington IN: Indiana University Press. Davis, M. (2006) Planet of Slums. New York NY: Verso. De Boeck, F. (2012) ‘Infrastructure: commentary from Filip De Boeck’, Cultural Anthropology website, 26 November <https://culanth.org/curated_collections/11-infrastructure/discussions/7-infrastructure-commentary-from-filip-de-boeck>, accessed 23 August 2017. De Boeck, F. (2015) ‘“Poverty” and the politics of syncopation: urban examples from Kinshasa (DR Congo)’, Current Anthropology 56 (11): 146–58. De Boeck, F. and Plissart, M.-F. (2004) Kinshasa: tales of the invisible city. Tervuren: Ludion. Evens, T. M. S. and Handelman, D. (eds) (2006) The Manchester School: practice and ethnographic praxis in anthropology. London and New York NY: Berghahn Books. Ferguson, J. (1999) Expectations of Modernity: myths and meanings of urban life on the Zambian Copperbelt. Berkeley, Los Angeles CA and London: University of California Press. Fortes, M. (1969) Kinship and the Social Order: the legacy of Lewis Henry Morgan. London: Routledge. Fortes, M. (1978) ‘An anthropologist's apprenticeship’, Annual Review of Anthropology 7: 1–30. Geschiere, P. (1997) The Modernity of Witchcraft: politics and the occult in postcolonial Africa. Charlottesville VA: University of Virginia Press. Geschiere, P. and Gugler, J. (1998) ‘The urban–rural connection: changing issues of belonging and identification’, Africa 68 (3): 309–19. Guichard, M., Grätz, T. and Diallo, Y. (2014) Friendship, Descent and Alliance in Africa. Oxford: Berghahn Books. Holston, J. (2009) ‘Insurgent citizenship in an era of global urban peripheries’, City and Society 21 (2): 245–67. Lambek, M. (2011) ‘Kinship as gift and theft: acts of succession in Mayotte and ancient Israel’, American Ethnologist 38: 2–16. Meagher, K. (2010) Identity Economics: social networks and the informal economy in Nigeria. Woodbridge: James Currey. Miller, D. (2007) ‘What is a relationship? Is kinship negotiated experience?’, Ethnos 72 (4): 535–54. Mitchell, J. C. (1966) ‘Theoretical orientation in African urban studies’ in Banton, M. (ed. ), The Social Anthropology of Complex Societies. London: Tavistock. Moore, H. L. and Vaughan, M. (1994) Cutting Down Trees: gender, nutrition and agricultural change in the Northern Province of Zambia 1890–1990. London and Portsmouth NH: James Currey and Heinemann. 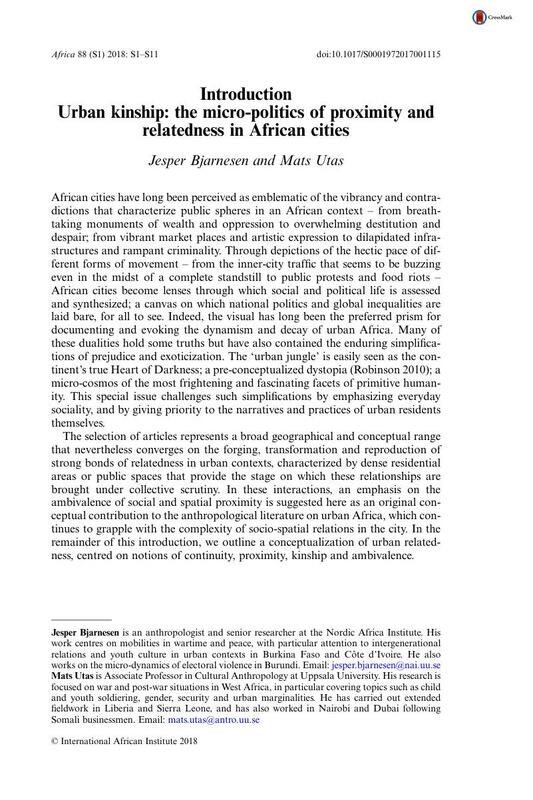 Myers, G. (2011) African Cities: alternative visions of urban theory and practice. London and New York NY: Zed Books. Nutall, S. and Mbembe, A. (eds) (2008) Johannesburg: the elusive metropolis. Durham NC and London: Duke University Press. Pieterse, E. and Parnell, S. (2014) ‘Africa's urban revolution in context’ in Parnell, S. and Pieterse, E. (eds), Africa's Urban Revolution. London and New York NY: Zed Books. Pitt-Rivers, J. (2016) ‘The paradox of friendship’, HAU: Journal of Ethnographic Theory 6 (3): 443–52. Reynolds Whyte, S. and Whyte, M. A. (2004) ‘Children's children: time and relatedness in Eastern Uganda’, Africa 74 (1): 76–94. Riesman, P. (1992) First Find Your Child a Good Mother: the construction of self in two African communities. New Brunswick NJ: Rutgers University Press. Robinson, J. (2010) ‘Living in dystopia: past, present and future in contemporary African cities’ in Prakash, G. (ed. ), Noir Urbanisms: dystopic images of the modern city. Princeton NJ: Princeton University Press. Sahlins, M. (2013) What Kinship Is – And Is Not. Chicago IL: University of Chicago Press. Simmel, G. (1950) The Sociology of Georg Simmel. New York NY: Free Press. Simone, A. (2004a) ‘People as infrastructure: intersecting fragments in Johannesburg’, Public Culture 16 (3): 407–29. Simone, A. (2004b) For the City Yet to Come: changing African life in four cities. Durham NC and London: Duke University Press. Simone, A. (2010) City Life from Jakarta to Dakar: movements and the crossroads. New York NY and London: Routledge. Strathern, M. (2014) ‘Kinship as a relation’, L'Homme 210: 43–62. Habitat, UN (2014) The State of African Cities 2014: re-imagining sustainable urban transitions. Nairobi: United Nations Human Settlements Programme (UN-Habitat) <http://unhabitat.org/books/state-of-african-cities-2014-re-imagining-sustainable-urban-transitions/>. Utas, M. (2012) ‘Bigmanity and network governance in African conflicts’ in Utas, M. (ed. ), African Conflicts and Informal Power: big men and networks. London: Zed Books. Wacquant, L. (1999) ‘Urban marginality in the coming millennium’, Urban Studies 36 (10): 1639–47.